First of all, thank you for choosing us. It is definitely our pleasure to be able to help you in your dental needs and help you get out of dental pain however necessary. At Tooth Heaven, we do things alittle differently here than most dentists. Because you are our priority, your first visit here will be treated with the utmost respect. Your first visit may include photos, x-rays and a discussion on what you would like us to help you with. As such, if you're not in any pain, we usually dedicate the first visit ( usually 45 minutes long) to a checkup and a clean whenever needed or if possible. We want to spend that time with you and not have to rush through your visit, leading to missed things that should be addressed early on to avoid further issues from happening. If you're in pain, we will try to fit you in on the same day and will focus on getting you out of pain and may need to reappoint you, should you need further treatment. You can make your appointments over the phone ( 03 - 9376 0543 ) or ONLINE by clicking the link at the bottom of the page. 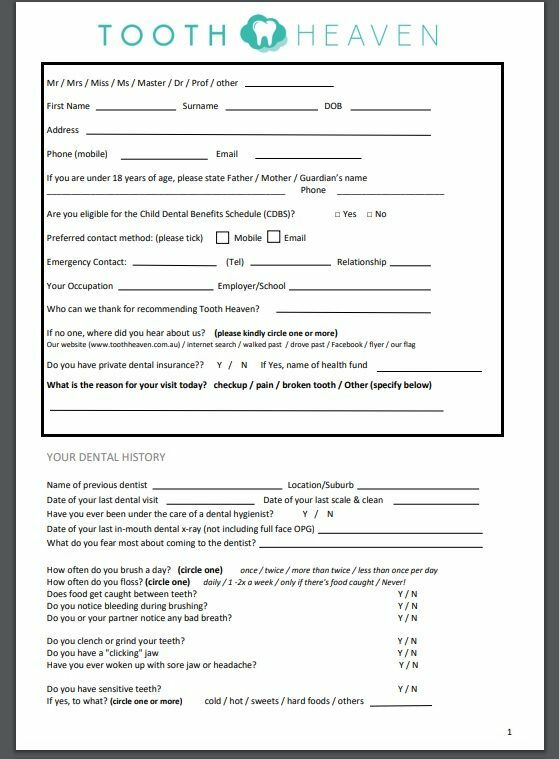 Attached is a PDF new patient form that if filled up at home and brought to the clinic, would make your visit here a breeze. Looking forward to seeing you here at Tooth Heaven !